The great danger of meditation and other techniques for the inner life: it often ends up as dialogue with oneself. In Jesus’ parable of the Pharisee and the Tax Collector, the Pharisee entered the Temple of God and did nothing more than dialogue with himself. The Greek text says, πρὸς ἑαυτὸν ταῦτα προσηύχετο: the most direct translation is “to himself he thus prayed.” The RSV translation says, “with himself” – a slightly more moderate image, but the Greek text does say “to himself”! The tax collector entered not perhaps knowing what he was looking for. Perhaps like Zacchaeus last week; he had no agenda. Confronted with God’s holiness in the Temple he poured out his contrition. “God be merciful to me a sinner.” No long speech, no self-exaltation or self-justification! He entered the Temple of God and there found God, not his own ego. He too, was a son of Abraham! It reminds me of one of my favourite psalms, Psalm 73, a psalm of Asaph. It is a psalm that tells of a severe life-crisis, a crisis of faith, a crisis that comes from looking at the way the world functions! He could have been describing the Pharisee in the parable Jesus spoke. The psalmist is greatly confused. He is brutally honest with God, and in a sense he is challenging his own faith. Is it in vain, after all? Should he have lived his life like the wicked after all? No, no, he couldn’t think this way. Why? I would have been untrue to the generation of your children. This is a powerful statement by Asaph. He is tempted to turn away from his righteous living and become like the wicked. But he is not alone; he has a responsibility to the generations of God’s children. He is accountable! And that’s a universe away from the values of today’s society, where people owe nothing to anyone! They’re accountable only to themselves – if even that. We are self-absorbed; Asaph was absorbed in his concern for others and what his actions or decisions would do for the “generations of God’s children! Biblical morality is always about the “other” and the impact of our actions on the “other”. He went into the Temple and there he got the answer to his confusion. He saw “their end” – how God will deal with the wicked. He doesn’t tell us any more than that. 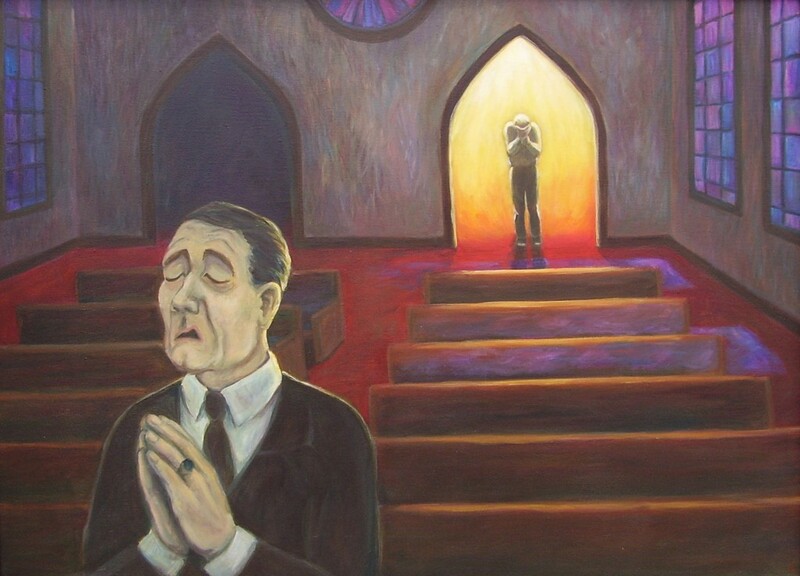 I visualise him standing in the Temple and pouring out his confusion and spiritual turmoil to God. And somehow God reassured his faith. The experience transformed him. 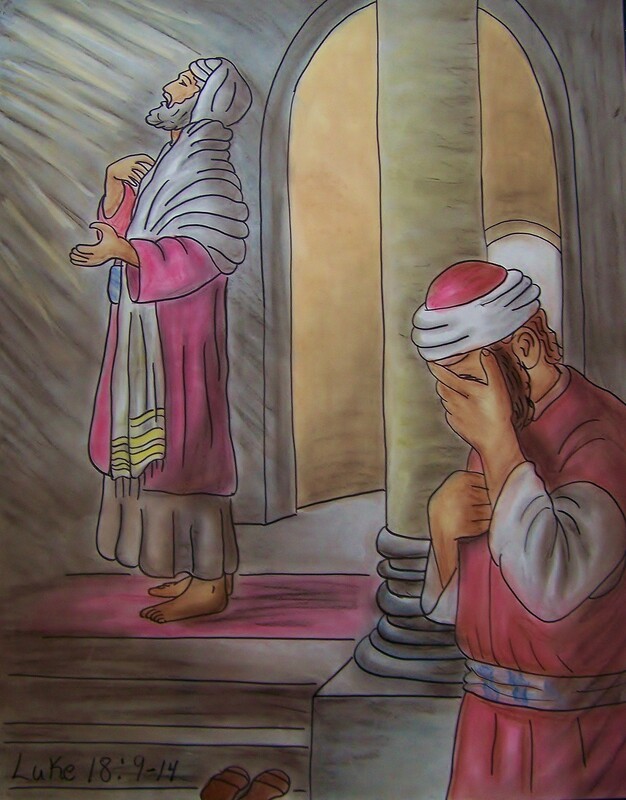 Two men went into the Temple in the Parable of the Pharisee and the Tax Collector. One was full of himself, but he lost himself in the flood of egotistical and judgmental words that came from his mouth. The other man was in crisis; he was empty; he entered the Temple with no expectations and begged for mercy. He left a new man. Not only did he find himself, in the Temple he was found by God. Just as Zacchaeus was found by Christ. We also come to the Temple every Sunday morning, and sometimes on other days as well. We come like Asaph, like the tax collector, perhaps even like the Pharisee. We have questions, we come looking for forgiveness; sometimes we even come to satisfy our egos. But if we come with open minds and hearts, we leave changed men and women. P.S. I chose not to include the recording of this sermon as I was distracted a couple times during the sermon by activity in the congregation and it affected my delivery. Categories: Sermons | Tags: Parable of the Pharisee and the Tax Collector | Permalink. The Difference is in the Joy! What is the difference between Zacchaeus and the rich ruler who turned away from Jesus? The rich man came with an agenda. Zacchaeus had no agenda except to see Jesus. And that, dear friends, is often the thing that makes all the difference. Do you know what’s wrong with people who think they’re saved? Or who come up to you and ask you if you’re saved? They have an agenda. And their agenda is more important than seeing Jesus. The rich ruler went to Jesus and asked him what he had to do to inherit eternal life. Jesus dialogued with him, but when Jesus gave him the answer he did not want to hear, he turned away disappointed. And Jesus spoke those memorable words: “It is easier for a camel to go through the hole of a needle than for a rich man to enter the kingdom of God.” The disciples are startled. After all, rich people were held in awe, just as they are today. Then who can be saved? they ask him. What is impossible with men is possible with God, Jesus replies. Both Zacchaeus and the rich ruler were wealthy, but something else, not their riches, was the deciding factor. 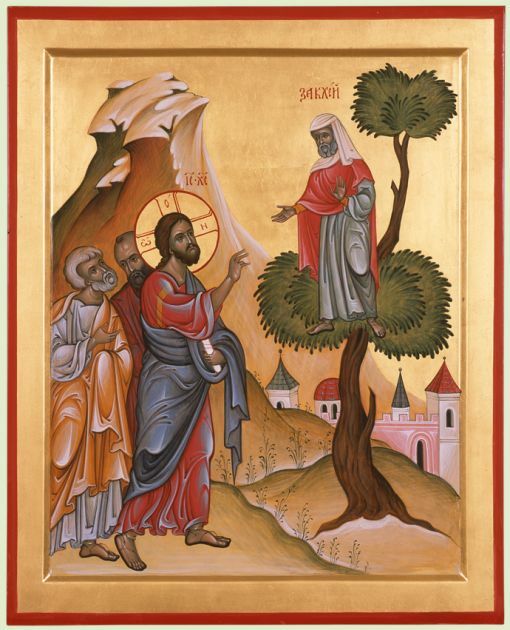 The encounter with Zacchaeus is precisely an example of what is possible with God! Zacchaeus does not go to Jesus with any question about eternal life; he had no agenda. He only wants to see Jesus, and he climbs a tree to get a clear view. He doesn’t call Jesus; Jesus calls him down from the tree and tells him he’s going to be a guest at his house. The initiative is completely Jesus’. And what is Zacchaeus’ reaction? He hurries down and receives Jesus joyfully. That is the key word – joyfully. He received Jesus into his home joyfully. The transformation in his heart and spirit began right away: He gives half of his goods to the poor, and if he had cheated anyone – that’s what tax collectors did in those days – he gave it back four times! Do you see this as an image of salvation? His immediate response to Jesus entering his home was not to say, I’m going to build a church in your honor, a big beautiful church. Jesus touched his heart and he in turn touched Jesus’ heart by his decision to give to the poor. That, dear friends, is what salvation is all about – a meeting of hearts, our hearts with Jesus’ heart. Don’t go to Jesus in order to be saved. Go to Jesus because you’re drawn to him, you love the sound of his words and his voice in the Gospels. Don’t go for miracles, go to him with a curious mind and heart. You want to know him and the Father who sent him. Go to him as a child. He said it: Unless we become as children we cannot enter the kingdom of God. That sounds just as serious as the saying about rich men. Am I going to be 5 years old again in order to enter eternal life? No, but I should go to him like a child, curious, wide-eyed, expecting a joyful experience. “Today salvation has come to this house, since he also is a son of Abraham. For the Son of man came to seek and to save the lost.” He seeks, he looks for us, he calls us. All he asks of us is an open mind and an eager curiosity like Zacchaeus. And then to respond to his presence, with joy and open hearts. And note what he said: He also is a son of Abraham. She also is a daughter of Abraham. How many of Abraham’s children today do we close the door to? Aren’t Muslims also sons and daughters of Abraham? They certainly consider Abraham their father in faith. Why do we hate them? And why do many of them hate us? What would Jesus say? I don’t have the answer; I’m just posing the question. It’s part of my curiosity coming to Jesus and hearing his voice. Categories: Sermons | Tags: salvation, Zacchaeus | Permalink. In a previous post I outlined some thoughts Karl Barth offered at a gathering in 1962 and which constitute one chapter of the book, Barth in Conversation. He was asked to say something about the church in a totalitarian state, such as existed in 1962 in East Germany and other countries behind the Iron Curtain. Barth had experienced totalitarianism in Germany in the 1930s and had opposed it in his sermons, writings and church activism. So it was perfectly reasonable for that 1962 gathering of Protestant book dealers in Switzerland to ask him such a question. In my previous post I shared his thoughts on totalitarianism in general and I drew a connection between his thoughts and what Paul called the powers and principalities that rule our lives. I offered the example of social media and the internet as contemporary manifestations of the powers and principalities. But let’s return to Karl Barth and see how or if he answers the question about the church in a totalitarian society. Barth was asked about “possibilities” for the church in a totalitarian state. Barth turns to the question by first rejecting the term possibilities in the plural. The church knows that all the totalities of the world and society and also of the state are actually false gods and therefore lies… Whenever the church takes these lies seriously, then it is lost. With all calmness and in all peace, it must treat them as lies. And the more that the church lives in humility and knows that “we too are only human, and there are also many lies in us,” then it will know all the more surely that “God sits in governance” over and against the lies that are in us and over and against the lies in the world and in the state and wherever else they may be. And in that case the church, regardless of the circumstances and no matter how entangled and difficult the situation, remains at its task and knows itself to be forbidden to fear for its future. Its future is the Lord. He, not the totalitarian state, is coming to the church. I don’t need to quote any more of Barth’s comments. It’s plain to see his approach in dealing with matters of political and spiritual urgency. He always comes back to the original vision of the Scriptures. He does not rely on any historical experiences of the church because he knows that the church easily fell and falls into lies. He saw the German church capitulate to the lies of Hitler in the 1930s. He and Dietrich Bonhoeffer were the most prominent spokesmen against the lies of Nazi racist ideology. But almost all German church leaders preferred to listen to the lies of Hitler than the warnings issued by Barth and Bonhoeffer. 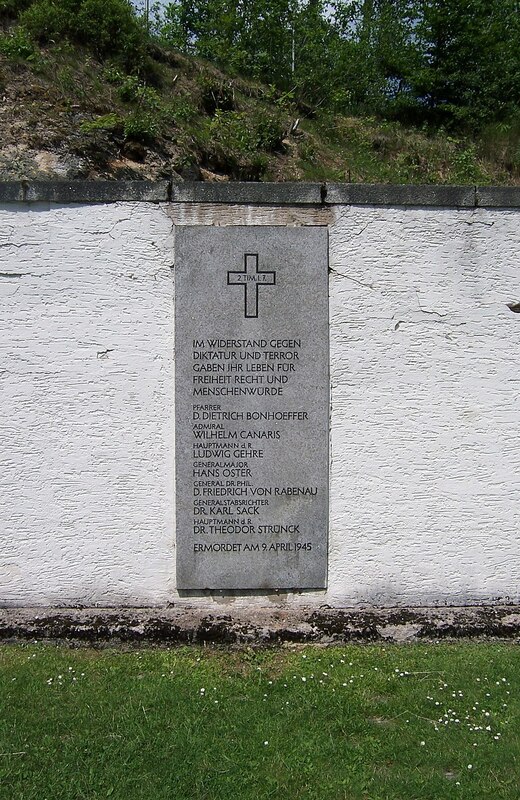 Bonhoeffer and other courageous Christian opponents of Hitler paid with their lives and became martyrs for the faith in the murderous hands of the Reich. Barth refused to give allegiance to the powers and principalities, whatever form they took. Standing firmly on the Scriptures, he was able to see through the lies and deceptions. That is the church’s greatest task in every generation. We are not here to adapt the Christian message to any social movement or moment. As another recent Christian activist put it, Jesus Christ did not bring about the kingdom of God by “christianizing the social order” (John Howard Yoder, as quoted in The Wisdom of the Cross, edited by Stanley Hauerwas et al, page 199). The patristic era of the church is often invoked as a time when the Roman Empire was indeed “christianized”: pagan practices, rituals and temples were replaced by Christian analogues. Barth would have none of that. The temptation is too great, and the church never mustered the spiritual strength to withstand the allure of prominence and success in the eyes of the world. So yes, there is nothing outdated in Barth’s opposition to Hitler in the 1930s or the comments he made in 1962 in the face of the Iron Curtain that divided Europe. The church must always be κύκλῳ, around Christ. He is the only totality the church should recognize. And I love that word, totality, that Barth uses. We always have and always will live in times of totalities: entities that command our full attention and allegiance, that drain our attention spans, that make it impossible for us to be challenged by the Scriptures in their full force. Barth was born (1886) into a world where the integrity of the Scriptures was questioned. How could the Bible still be called the Word of God when scholars had proven beyond any reasonable doubt that the Old and New Testaments were written by fallible human beings over the course of many centuries? Barth’s confidence was not shaken by these developments. But neither was he a fundamentalist. He saw that the writers of the Bible were completely, passionately absorbed and transformed in the message they were communicating, and by their writings they transmitted this message to anyone who is prepared to be similarly affected. The Scriptures are a message from God. True, spoken and transmitted indirectly through human words and understanding. But that does not take anything away from their power to transform human lives and to guide us through difficult times. Indeed, acknowledging the human element only strengthens the Scriptures: in addition to being God’s message to us, the Scriptures are also a response to God’s message. And we also must stand in our own time and respond to God’s clear message. Jesus Christ is the only totality I as a Christian should accept in my life. When I don’t, I capitulate at least part of my affections to the powers and principalities that lurk at every corner. I will never be a Karl Barth. But I know from experience that I am strongest in my resistance to the fallen powers and totalities when I place myself under the government of Scripture. Categories: Biblical Explorations, Radical Christian Thoughts | Tags: Dietrich Bonhoeffer, Karl Barth | Permalink. What did Jesus do after his baptism? Why was he baptized to begin with? Perhaps we will find the answer by looking at what happened after his baptism. Today’s Gospel reading coming on the Sunday after Epiphany might give you the impression that right after his baptism he began preaching, “Repent for the kingdom of heaven is at hand.” But between the baptism and today’s passage in the Gospel, something very significant happened in the life of Jesus. Note the more aggressive action of the spirit in Mark’s version – ευθύς…εκβάλλει! What happened in the desert is the key to understanding his baptism. There he was tested by the devil three times. I’ll follow Matthew’s sequence of the three temptations instead of Luke’s. First temptation: “If you are the Son of God, command these stones to become bread.” An echo of the time in the desert when God fed his people with manna from heaven. Jesus goes right back to that time and quotes Moses’ words in Deuteronomy: It is written, man shall not live by bread alone, but on every word that proceeds from the mouth of God.” It is interesting that Moses himself said that in the same sentence as he reminded his fellow Jews of the manna! As if he was saying to them, don’t get too excited about the miraculous manna; get excited about the words God speaks to you and the reasons why God sends the manna and does other miracles in your lives. 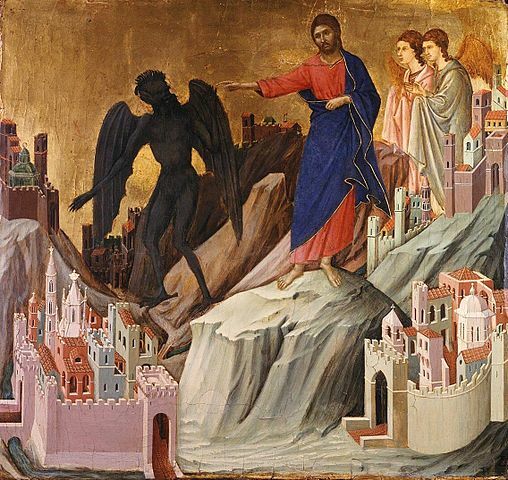 Second temptation: The devil takes Jesus to the highest point of the temple in Jerusalem and tells him to throw himself down to see if angels will come to rescue him. Jesus answers again from Deuteronomy: You shall not put the Lord your God to the test. Jesus allows himself to be tested/tempted, but he will not test God! Third temptation: The devil shows him all the kingdoms of the world and all their glory and promises to give all these to him if Jesus would bow down and worship the devil. This is the last straw, and now Jesus calls him by his more proper name: Away from me, Satan. For it is written, Worship the Lord your God, and serve him only – and again Jesus quotes from Deuteronomy, the same chapter 6 he used to fight the second temptation. It is in that same 6th chapter of Deuteronomy that we hear those wonderful words: “Hear, O Israel. The Lord our God, the Lord is one. Love the Lord your God with all your heart and with all your soul and with all your strength.” This is the Shema Yisrael – the most important affirmation that Jews speak morning and night as the summary of their faith. Jesus’s baptism was necessary as his own immersion into the history of his people. The God of the Bible is not an aloof God; he is in the midst of his people. As he was in the desert with Moses after the exodus, he is here in the person of Jesus. But the baptism was not only an immersion in the history of his people, it was also the conclusion of that history. Something new, something great was about to happen. “Behold, I do something new,” God spoke through the prophet Isaiah. God was always doing something new, something surprising. And the greatest surprise was about to unfold. But first some unfinished business. The devil had to be dealt with. He was and is the constant opponent of God’s new order. And he does this with the tricks of the marketplace: good food, security, idolatry… Anyone who promises a comfortable and secure life we will gladly vote for and gladly worship. Money, security, and all the goods the marketplace has to offer – that’s all we need to turn away from God. Ancient Israel had barely escaped slavery in Egypt that they wanted to go back to slavery in Egypt: at least that was better than facing an uncertain future with Moses! Can you love God more than you love the trinkets and comforts of a secure life? And how secure really is our life, really? A wrong button in Hawaii yesterday could have started a nuclear war! “Someone clicked the wrong thing on the computer.” Love the Lord your God with all your heart and with all your mind and with all your strength – that is the challenge. Don’t accept the deceptive promises that the gods we have created make. Matthew and Mark tell us that after the devil left, angels came to look after Jesus. 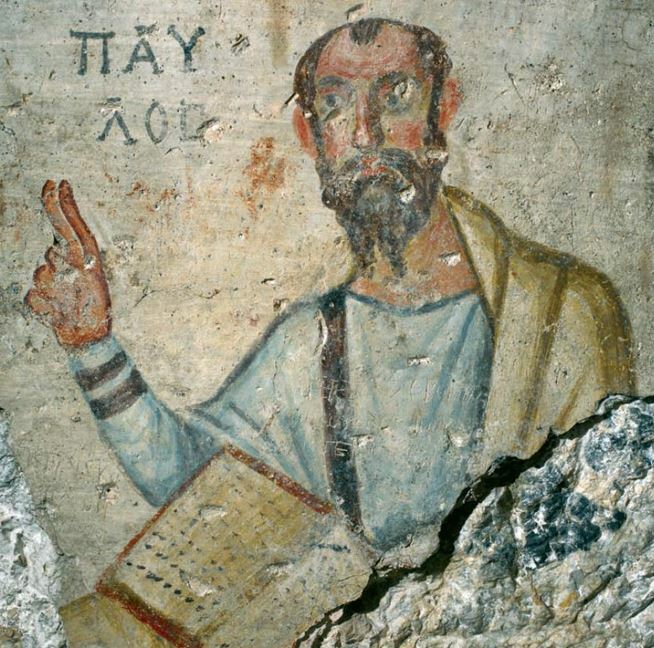 Luke says something more ominous, no angels in Luke’s version: And when the devil had finished all his tempting, he left him, for the time being – άχρι καιρού – until another time. Ominous. The devil is the same tempter at all times. He does not change. God changes – the devil does not! He tested Israel in the desert; he tested Jesus in the desert; he tests every one of us in the desert of our own failures. Jesus was baptized in order to immerse himself completely in the story of his people. 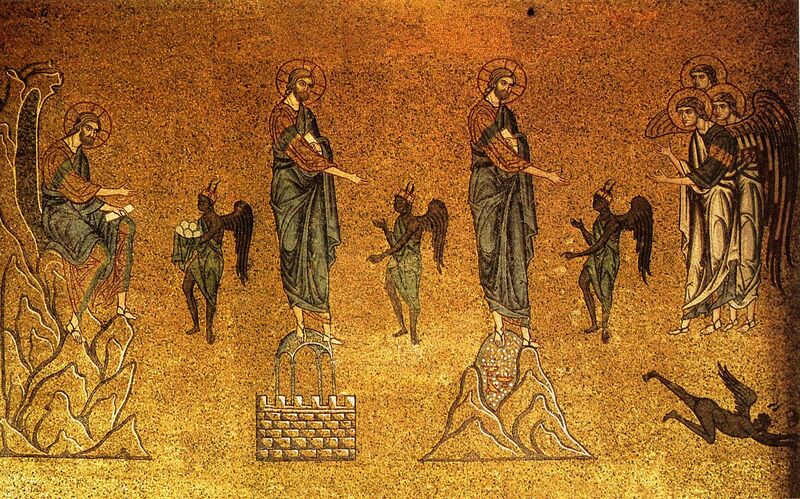 He re-lived all the temptations of his people by confronting the devil. Then and only then does he go out and start preaching, “Repent, for the kingdom of heaven is at hand.” Repent, change your mind about God and life. Don’t worship the false gods and the enticing promises they make. Worship the Lord your God, and let the Holy Spirit take you into the marvelous new life of Jesus. He was baptized for you; he lived for you; and he died for you. But he then rose from the dead so you and I might also rise from the dead. Awake, O sleeper, face the new dawn! Categories: Biblical Explorations, Sermons | Tags: baptism of Jesus, Deuteronomy, Shema Yisrael, temptations of Jesus | Permalink. “I saw the spirit descend and remaining upon him” – so speaks John the baptizer to his circle of followers about his baptism of Jesus. It is from this circle of John’s followers that Jesus drew his first disciples. In our reading from the Book of Acts this morning, we hear of an encounter between the apostle Paul and some Christians in Ephesus. Paul asks them if they received the Holy Spirit. They don’t know anything about the Holy Spirit, they had only received John’s baptism. How they had received John’s baptism in Ephesus, when John had already been killed and had done all his baptizing in the Jordan? Perhaps some of John’s disciples who did not become disciples of Jesus had carried on the type of baptism that John had practiced? That’s the most likely explanation I can think of. Paul instructs them that John’s baptism was only a baptism of repentance, only to prepare for the one who was coming. Just as John himself said, “After me comes a man who ranks before me, for he was before me.” Interesting here these words of John. He saw deeply into the mystery of Jesus Christ – “he was before me,” yet John was born 6 months before Jesus! Surely John is pointing to an origin beyond human birth. John himself acknowledged that he baptized only with water. Jesus would baptize with the Holy Spirit! 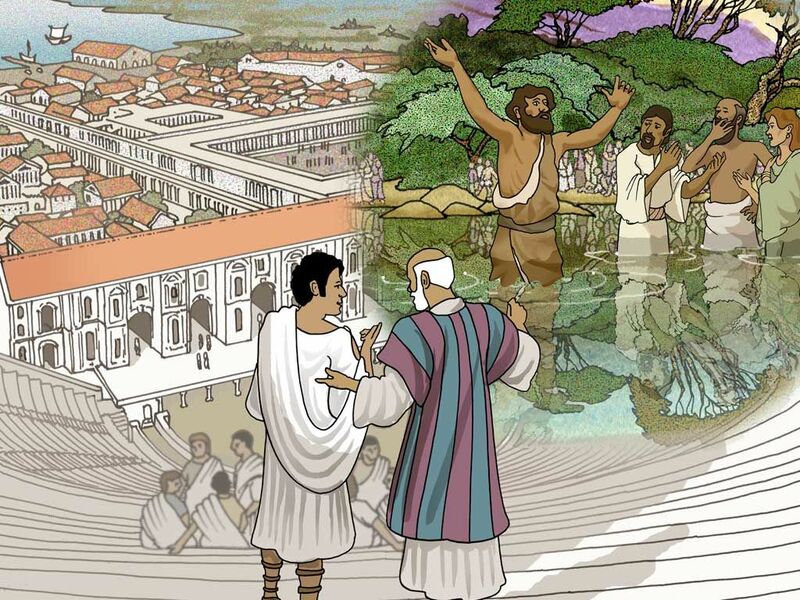 In Ephesus, Paul met some followers of Christ who had only received the water baptism of John. 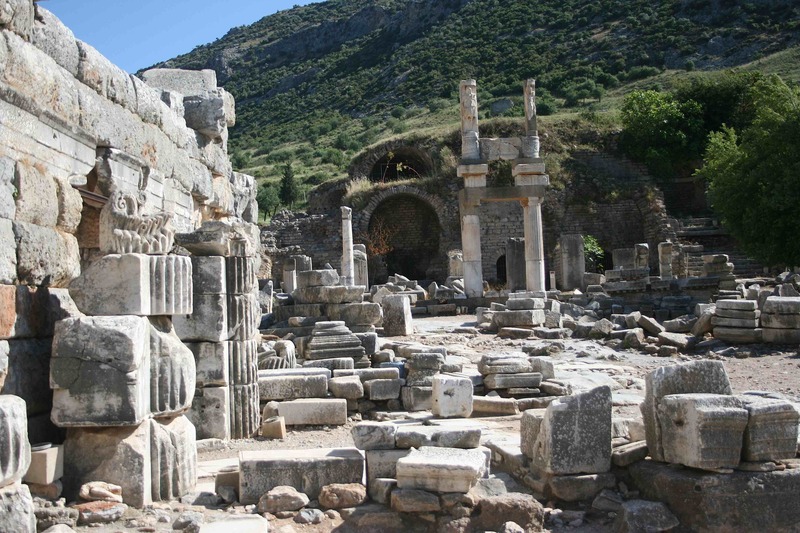 This is what was missing in these Christians in Ephesus that Paul encountered. So Paul baptized them in the name of Jesus and the Holy Spirit came upon them, and they spoke in tongues and prophesied – which is what usually happened in those early days when people were baptized. And we must not confuse that with what Pentecostals claim today about speaking in tongues. But here is today’s message. Baptism is incomplete without the Holy Spirit. Anyone can be baptized in water, in other religions also – but only the Holy Spirit makes a baptism truly a baptism into Christ, into the fullness of life that Jesus Christ brought into the world. This is why the Orthodox Church believes that the gift of the Holy Spirit should not be separated from baptism, but follows immediately after the baptism, even in the baptism of a baby. Our Orthodox practice is theologically and biblically correct; but it has its disadvantages, in that we have neglected to develop a rite of passage when a child or young person reaches the maturity to understand the faith into which he or she was baptised. Have you ever noticed how the Holy Spirit is referred to in our Liturgy? This is a typical conclusion of a prayer addressed to God the Father: “Through the mercies of your only begotten Son with whom you are blessed, together with your all holy, good and life creating Spirit, now and forever…” Listen in the Liturgy for this and many similar prayers. Even when we give glory to Jesus, we say “together with your Father who is from everlasting and your all holy, good and life creating Spirit…” Life creating, life giving – ζωοποιόν. The Spirit gives life, creates life. When we kneel, we pray that God will send his Holy Spirit “upon us and upon the gifts here presented.” It’s not a magical transformation of bread and wine into the body and blood of Christ, but a bestowal of life, the life of Christ onto the bread and wine! The Holy Spirit is always life-bestowing, life-creating. And the fullest blessing in the Liturgy: “The grace of our Lord Jesus Christ, and the love of God the Father, and the communion of the Holy Spirit, be with you all.” κοινωνία του αγίου Πνεύματος. This is the climax, this is the ultimate gift of the Holy Spirit, and why baptism is incomplete without the Holy Spirit. Fellowship, communion – first with God through Jesus Christ, but also with each other. We are not baptized to be isolated from other believers in Christ. We are baptised into fellowship. We receive the life of Christ with each other and through each other. No one is saved alone! The challenge to every Christian congregation is to experience the fellowship that is the gift of the Holy Spirit. 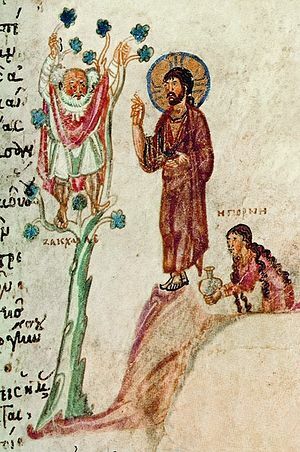 Mark, in his gospel account of the baptism of Jesus, wrote that “the heavens were torn apart” (σχιζομένους). The same verb is used in all three Synoptic Gospels (Mark 15:38; Matthew 27:51; Luke 23:45) at the crucifixion of Christ when the veil of the temple was torn in two (εσχίσθη εις δύο). This use of the same verb, σχίζω/εσχίσθη, is used in all three synoptic Gospels was not accidental, it was intentional in my opinion. First the heavens were torn open to break down the wall between God and humans. That was the beginning of Christ’s mission. Then, at the end of his mission on earth, the curtain in the Temple was torn to symbolise the tearing down of all walls that exist and will be built to separate people from each other and from our God-ordained destiny. I do not understand how any Christian can support the existence or construction of ANY walls, whether physical or mental. And the fellowship of the Holy Spirit – the communion with God and with each other that should fill and renew our lives. That is the blessing, and I greet the new year with that blessing. May it guide us as a community and every one of us as disciples of Christ. Amen. Categories: Liturgical Reflections, Sermons | Tags: baptism, Holy Spirit, Liturgy, Paul in Ephesus, walls torn | Permalink. I stand in awe of Karl Barth (1886-1968), generally acknowledged as the greatest theologian of the 20th century and one of the greatest of all time. My awe is not simply at his theological depth and understanding of Scripture; I’m awed at the sheer quantity of what he wrote and published. His greatest contribution to Christian theology is undoubtedly his magnum opus, Church Dogmatics, a multi-volume work of over 9,000 pages (in its original German). When I consider this huge work and the countless other books and papers that he contributed to a deeper understanding of our Christian faith, I cannot help but think how meagre our own efforts are. Today, with all the tools that technology has given us to make research and publication so easy, what theologian produces one-tenth or one-hundredth of what Barth produced with only a typewriter and printed books at his disposal? 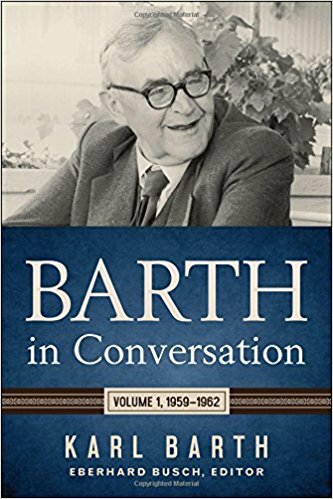 As I said, I stand or sit in awe of Barth – and other men like him of bygone eras who produced books for the ages instead of idiot tweets that our own era will be known for. The recently published book, Barth in Conversation, Volume 1, 1959-1962, contains precisely what its title signifies, transcripts of various public “conversations” in which Barth participated and in which he answered questions posed to him by a variety of people – not just professional scholars and clergy, but also journalists and even prisoners! 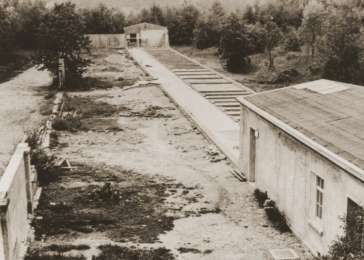 Barth was very fond of visiting prisons and having group conversations with prisoners. When he toured the United States in 1962, he insisted on visiting some major prisons, including San Quentin in California. The greatest theologian of the century was no aloof elitist. “Totalitarian” – that somehow refers to something whole, comprehensive. And when one says “totalitarian state,” one apparently means a state that demands something in its entirety from humans….that they place themselves without reservation at the disposal of its teaching and its will and its purposes. The total state is a state that says, “You shall love me with your whole heart, with your whole mind, from the entirety of your soul, and from the entirety of your strength” (and here Barth is clearly alluding to God’s command in Deuteronomy 6:5 as being demanded by the state). And there we have the mystery: the total state, even when it poses as being atheistic, is a state that arises in the shape of a deity and wills to have from humans that which only God can will to have from humans. That is the imposing thing about such a totalitarian state: it is, so to say, a caricature of God. Even when it wishes to be atheistic, it somehow has to represent God in a distorted form on earth….a curious contradiction: the godless atheistic state that presents itself, reveals itself, and represents itself as divine. Is it clear to all of us that not only the Communist state and also not only the Hitler state, but rather every state has something of the totalitarian state in it, that every state, even the finest and freest and most democratic, thus resembles a large cat, which has fine paws to be sure, but whose paw has claws stuck in it somewhere? And the claws in the cat’s paw – that is the totalitarian element in every state: and one can never be entirely certain just when that totalitarianism will appear. As I say, in every state! After giving a couple recent examples in Swiss history, he goes on to some startling statements which should give us pause to reflect on our own habits. You know, that’s how it is with the totalitarian spirit: it doesn’t begin with the state. Human society, if you will, is totalitarian as such. Society around us automatically demands certain things from us. It doesn’t make much noise, as long as one goes along with it. But when one doesn’t go along, when one swims against the stream, things get nasty….What “they” believe and think and do – this “they” governs “in the air” (reference to Ephesians 2:2 and Paul’s teaching about powers and principalities in Ephesians 6:12). Without police! No one lands in prison. But everyone has to do and has to approve what “they” do and approve….Because society is always based on this “they”, there is also occasionally a totalitarian state, and then its claws become more or less apparent…. Or take something else, what we now call “traffic”. Take a look at our streets with all these cars! I have just had this experience in America….four cars next to each other in one direction and four in the other direction! And nonstop, day and night. You ask yourself, what’s going on here? What are they all rushing to? Yes, they must rush. Things are in a hurry, yes, in a hurry. And so they hurry along. And then to realize that cars like this are rushing and racing all over the world! We wouldn’t have it any other way. No, we wouldn’t have it any other way. It must be so. But when something must be so, then it is something totalitarian. Modern people have mostly become car people, and to be sure, not in the sense that they govern cars, but rather that cars govern them. So now it should be evident to you that we live within an entire spiderweb of such powers and authorities, and you have before you what I call the totalitarian world. If I were present in an audience listening to this methodical exposure of the totalitarian instinct I would have become breathless. How true Barth’s words ring, and even more today than 55 years ago. Because how much further we have traveled down the road of totalitarianism! What would Barth say about today’s digital world, and especially social media and the power they hold upon a growing majority of the “world”? Hardly a day goes by that we are not reminded of the power social media exerts in our lives, even defining how many of us receive our news, influencing even elections in democracies such as ours. How free are we, truly? The things Barth used as examples of society’s totalitarian instinct are still with us – fashion, money, media, sports – but now we have an even more powerful force in the prevalence of social media. His image of “traffic” and cars applies even more to the digital world that now controls so much of our lives. The Guardian newspaper included a devastating article on New Year’s Day: Take it from the insiders: Silicon Valley is eating your soul. A pre-Christmas statement by Facebook claimed that although “passive” use of social media could harm users, “actively interacting with people” online was linked not just to “improvements in wellbeing”, but to “joy”. “In short,” the Guardian article states, “if Facebook does your head in, the solution is apparently not to switch off, but more Facebook.” So if you’re not happy, it’s because you’re not using Facebook enough! Don’t be a light user of Facebook and social media, immerse yourself, find happiness online with Facebook! The former Facebook president Sean Parker warned in November that its platform “literally changes your relationship with society, with each other … God only knows what it’s doing to our children’s brains.” God indeed only knows – or we will know when it will be too late, after we have created a few generations of robots ready to be assimilated into a Big Brother corporate totalitarian state such as those depicted in movies of dystopian futures. Another former Facebook executive was quoted to say: “The short-term, dopamine-driven feedback loops that we have created are destroying how society works. No civil discourse, no cooperation, misinformation, mistruth … So we are in a really bad state of affairs right now, in my opinion.” But he still loves the company! So must we all, despite what it’s doing to our brains and our social interactions. One Stanford University lecturer and tech consultant pontificates with statements like this: “For new behaviours to really take hold, they must occur often.” But even this devotee came to realize the truth of what he was promoting and eventually installed a device in his home that cut off the internet at a set time every day. Nice that the elite can have such digital solutions to digital sickness. Most people are not so lucky. Even Steve Jobs, inventor of the iPad, was quoted in 2010 to say that his children do not use the iPad. “We limit how much technology our kids use at home,” he said in an interview. Again, the elite have options that the majority of the people who will become drones in a dystopian future do not. I’m not exaggerating. The scariest part of all this and the reason why I want to relate it to the biblical teachings about powers and principalities is that the owners of these companies – Facebook, Google, etc. – do not have control over what their digital platforms are doing. It’s all done by bots – pieces of software that perform automated tasks – and other such digital entities which follow their own rules and probably create or will create their own realities. Tristan Harris recently told Wired magazine: “Right now, 2 billion people’s minds are already jacked in to this automated system, and it’s steering people’s thoughts toward either personalised paid advertising or misinformation or conspiracy theories. And it’s all automated; the owners of the system can’t possibly monitor everything that’s going on, and they can’t control it.” The same Tristan Harris asserted: “Religions and governments don’t have that much influence over people’s daily thoughts.” I don’t care about governments – I don’t trust them – but I do care about religion, especially my religion. So in a sequel to what I write here I want to look at Barth’s answer to the question originally posed to him: “What possibilities do you see for the existence of the church in a totalitarian state?” Can the Christian church have any resistance to the multiple threats of totalitarianism? Categories: Global Visions, Radical Christian Thoughts | Tags: Facebook, Karl Barth, powers and principalities, social media, totalitarian society | Permalink.